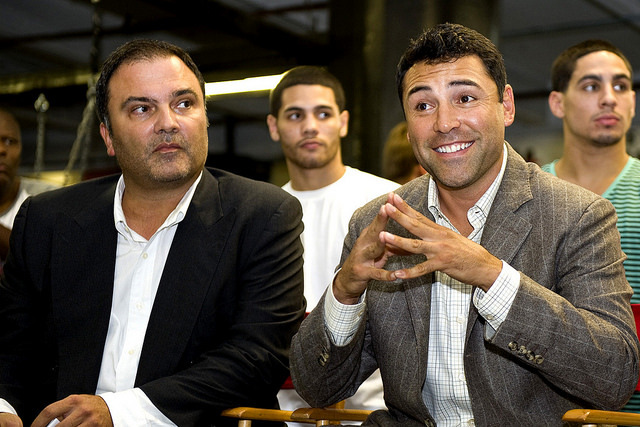 Breaking news: Oscar De La Hoya, aka The Golden Boy, dropped his $50 million lawsuit against former Golden Boy Promotions CEO, Richard Schaefer, on Friday, January 09th. The financial terms of the deal are being closely guarded as none of the parties wanted to speak to media but some notable fighters such as Danny Garcia, Adrien Broner, Daniel Jacobs, and Marcos Maidana. There are some Al Haymon fighters who have contracts under Golden Boy Promotions such as Amir Khan, Lucas Matthysse, and Leo Santa Cruz that will continue to fight for Golden Boy Promotions but for a limited number of fights. There wasn’t much information released on their terms just yet. Canelo Alvarez and Bernard Hopkins are still loyal to Oscar De La Hoya, Golden Boy Promotions, and HBO boxing. Although Al Haymon is not technically a boxing promoter and just a “handler” of pro boxers, he is the brains and power behind the fairly newly formed Mayweather Promotions, along with Floyd Mayweather, Jr and manager Leonard Ellerbe. Another caveat of this settlement is that Richard Schaefer will stay away from the boxing world for a period of time, which was not released, but some boxing sites are reporting to be about 2 years. On a side note, Oscar De La Hoya and Golden Boy Promotions signed a dozen new fighters to their stable. After considering the history of Al Haymon and Oscar De La Hoya, it’s safe to expect HBO boxing to continue to dominate Showtime Boxing for a long period of time as the former has exclusive rights with Golden Boy Promotions as well as Bob Arum’s Top Rank Promotions (which has Manny Pacquiao under contract). Bob Arum and Oscar De La Hoya want to give boxing fans the fights they want to see and Al Haymon clearly does not. Showtime boxing is doomed under the cancer known as Al Haymon, Floyd Mayweather, and the Money Team…..mark my words, folks!! What are your thoughts of this settlement? Did one side win over the other?